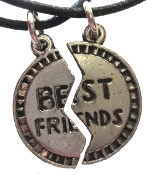 Funky Retro Broken Circle Puzzle BFF BEST FRIENDS PENDANT NECKLACE SET - Nostalgic Friendship Novelty Costume Jewelry - 1-for-YOU and 1-to-SHARE - Silver-tone Pewter metal charms, approx 1-inch (2.5cm) Tall x 1/2-inch (1.25cm) Wide, each on 18-inch (45cm) black leather-look cloth neck cord. Note: Manufacturer styles may vary from additional photos. *Main charms remain the same.